Out with the old (guard) and in with the new as Hoboken Housing Authority commissioner Dana Wefer easily became the new Chair of the body in a 5-2 vote. A nomination to re-elect Rob Davis as Chairman failed to get a seconding motion. Voting yes to Chairwoman Wefer: James Sanford, David Dening, Judy Burrell, Dave Mello and Dana Wefer. Voting no: Rob Davis, Jeanne Rodriguez. Commissioner Dave Mello was voted in as Vice Chair. The meeting displayed problematic behavior by the Carmelitos out of the gate with nasty remarks from a small group in the front of the room. Not long into the meeting, Michelle Lusane was ejected for repeatedly yelling out after ignoring a warning to refrain from doing so. following up on numerous questions raised earlier about spending with half-a-dozen vendors. the neighborhood of one million dollars over several years. That's not a typo - $1,000,000. More to come. Talking Ed Note: MSV experienced immediate harassment leading into the meeting by employees of the HHA. Sitting in a chair by the left pillar near the front of the room before the reorg meeting, the sound person, Mr. Robert Braxton came over and insisted doing so was not permitted. Attempts to ignore his imagined authority failed as he decided to escalate the matter. Another person identified as the site manager also was interfering saying MSV could not sit quietly by the left pillar. Mr. Braxton then proceeded to drag the chair about five feet - with MSV sitting in it. 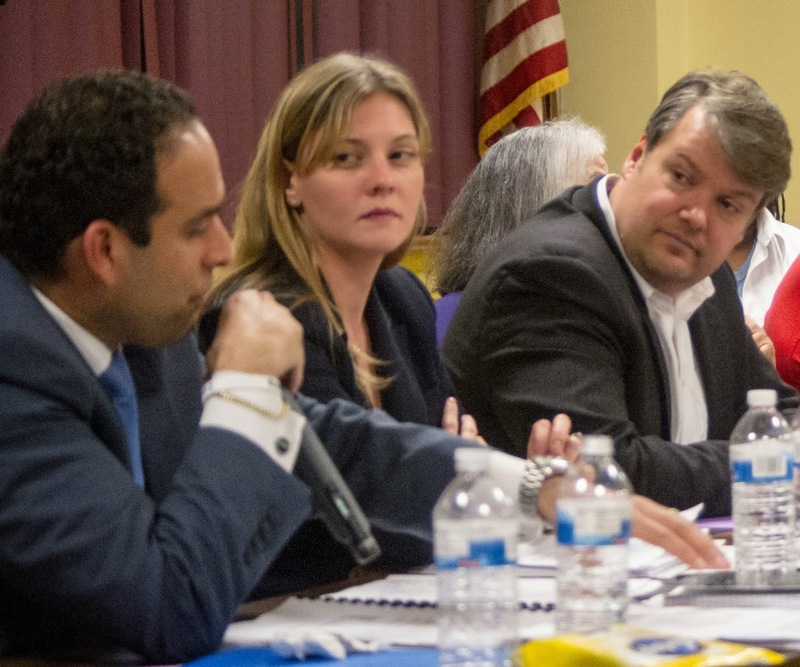 An immediate complaint was voiced to the Executive Director Carmelo Garcia as Beth Mason's political operative Matt Calicchio and HHA resident Kyelia Colon interjected claiming the incident never occurred. No one was asking them. Mr. Braxton responded to the verbal admonishment to keep his hands off. "I didn't touch you," he said matter of fact. The Hoboken Police Department had not yet arrived. For the record, MSV has sent an email to the HHA commissioners, counsel Charles Daglian and Carmelo Garcia after the last HHA meeting, complaining about the previous ejection by then Chairman Rob Davis preceding the ugly remarks by Garcia's Assembly aide, Patricia Waiters. The letter stated that no further interference with reporting would be tolerated. This will be taken up with the lawyer tomorrow. Congratulations to Dana Wefer and Dave Mellow. Ms. Wefer is proving already to be an outstanding choice acting with a high degree of professionalism and competence. She assigned all members to committees voicing hope it will result in new ideas and improvements brought to the Authority. In the video above, Chairwoman Dana Wefer announces formation of a new committee system. She's interrupted and a fracas breaks out. Pokey is ejected. Arlette Braxton then says they will all have to be thrown out. The police intercede and order is restored. Beth Mason political operative Matt Calicchio says he's calling for another protest outside of Dave Mello's home at the Sky Club.